Plug Code Wiring Tapes- Campbell International Specialist Tapes. Campbell's plug code wiring tape is used to detail the safe way to wire a plug or connector, they are seen and supplied internationally. As there are continually new laws and directives we provide probably the widest range and largest stock so you can receive the tape you require with prompt delivery. Please remember that it is often a requirement for plug code wiring tape to be applied to Secondhand or refurbished Products as well as new electronics. We are happy to print new or different text, add your logo or company name. Please Contact Us to discuss your requirements. Campbell's wire code tapes are two-ply laminated like many of our tapes. These are far superior quality than most other tapes you will find. They are easier to apply, more durable and less likely to curl, and the print is laminated between two layers of tape and will therefore not rub or wash off. Not sure which tape to choose? IWC5 is the standard tape applicable to most UK plugs. Size: 50mm x 33m Labels per roll: 170Text reads:IMPORTANT The wires in this mains lead are coloured in accordance with the following code:- Blue: Neutral Brown: Live As the colours of the wiring in the mains lead of this appliance may not correspond with the coloured markings id.. Size: 50mm x 33m Labels per roll: 170Text reads:IMPORTANT The wires in this mains lead are coloured in accordance with the following code:- Blue : Neutral Brown: Live As the colours of the wiring in the mains lead of this appliance may not correspond with the coloured .. Size: 50mm x 33m Labels per roll: 170Text reads:As the colours of the wires in the mains lead of this appliance may not correspond with the coloured markings identifying the terminals in your plug. proceed as follows:- The wire which is coloured blue must be connected to the terminal.. Size: 50mm x 33m Labels per roll: 170Text reads:IMPORTANT If the available socket outlet is not suitable for the plug supplied with this equipment, it should be cut off and an appropriate three pin plug fitted. With alternative plugs an approved fuse must be fitted in the plug.NOTE: .. Size: 50mm x 33m Labels per roll: 170Text reads:IMPORTANT If the available socket outlet is not suitable for the plug supplied with this equipment, it should be cut off and an appropriate three pin plug fitted. With alternative plugs an approved fuse must be fitted in the plug, .. Size: 36mm x 33m Labels per roll: 170Text reads:As the colours of the wires in the mains lead of this appliance may not correspond With the coloured markings identifying the terminals in your plug. proceed as follows:- The wire which is coloured green-and-yellow must be connected to .. Size: 36mm x 33m Labels per roll: 170Text reads:As the colours of the wires in the mains lead of this appliance may not correspond with the coloured markings identifying the terminals in your plug, proceed as follows:- The wire which is coloured blue must be connected to the terminal.. Size: 24mm x 33m Labels per roll: 170Text reads:IMPORTANT THE WIRES IN THIS MAINS LEAD ARE COLOURED IN ACCORDANCE WITH THE FOLLOWING CODE. GREEN AND YELLOW - EARTH BLUE - NEUTRAL BROWN - LIVE WARNING – THIS APPLIANCE MUST BE EARTHED Specif.. Size: 50mm x 33m Labels per roll: 170Text reads:WARNINGTHIS APPLIANCE MUST BE EARTHED IMPORTANT The wires in this mains lead are coloured in accordance with the following code: Green-and-yellow: Earth Blue: Neutral Brown: Live As the colours of th.. Size: 50mm x 33m Labels per roll: 170Text reads:FLEXIBLE CORD WARNING LABELIf the socket outlets in the home are not suitable for the plug supplied with this appliance it should be cut off and an appropriate three pin plug fitted. NOTE- The plug severed from the mains lead must be de.. Size: 36mm x 33m Labels per roll: 170Text reads:WARNING This apparatus must be earthed IMPORTANT The wires in this lead are coloured in accordance with the following code Blue - Neutral Brown - Live 1 Black - Live 2 Green & Ye.. Size: 30mm x 33m Labels per roll: 170Text reads:IMPORTANT The wires in this mains lead are coloured in accordance with the following code:- GREEN & YELLOW – EARTH BLUE – NEUTRAL BROWN – LIVE Fittings marked [ ] are double insulated and do not need to be earthed. In .. 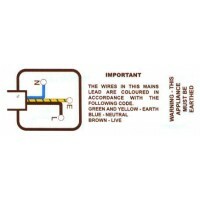 Size: 38mm x 33m Labels per roll: 170Text reads:WARNING THIS APPLIANCE MUST BE EARTHED IMPORTANT The wires in this mains lead are coloured in accordance with the following code Green and yellow: Earth Blue: Neutral Brown: Live As the co.. Size: 25mm x 33m Labels per roll: 170Text reads:IMPORTANT THE CORES THE FLEXIBLE CORD SUPPLIED WITH THIS APPLIANCE ARE COLOURED WITH THE FOLLOWING CODE BLUE:- NEUTRAL BROWN:- LIVE THIS APPLIANCE MUST BE EARTHED WITH A FIVE AMP FUSE Specification: Base - Rigid..